Unlike other tire pressure monitoring systems on the market that require a 5-7 minute wait for information, this monitor instantly gives you the most up-to-date tire pressure information. 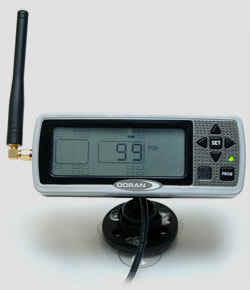 Other features include a powerful internal antenna and an easy-to-read large LCD display. This display receives leak information and gives visual and audible signals if pressure is low, high, or in the event of a fast leak. The display is easy to understand and operate. For example, once the display is in operation, you need to look no further than the green light. Namely, "green means good" and in this case, you can rest assured knowing that your tires are all properly inflated. The programmable display can be programmed from either left to right or from right to left to match your application. The programming is so simple that the sensors can be programmed quickly from your driver's seat. No more running from tire to tire in the hot sun or rain, as other tire pressure monitoring systems require you to do. These heavy-duty wireless Sensors send a signal containing tire pressure data to the portable dashboard display (underseat mounting is optional for the motorcycle monitoring system). They are designed and tested for heavy duty use, with an expected battery life of 7 years. We have spared no expense in using high end materials for the system, such as gold plated traces on our circuit boards, along with state of the art technology to conserve battery life. The Sensors are also 100% potted (an encapsulating material). This potting material not only prevents the Sensor from leaking air, but it also protects the internal components against vibration and moisture. Each Sensor has its own serial number, and since we have millions of serial numbers, your chance of cross talk with other vehicles is almost impossible. The displays were designed from extensive marketing research efforts. The compact display is 5.65" W x 2.14" H x 1.14" D. The display power wire can be simply plugged into an accessory with a 12 volt power outlet or for a more custom installation; you can hard wire the display into your electrical system. We provide a third wire for hard wire installations that will allow you to keep the display in a sleep mode. This sleep mode enables you to receive a fresh reading from the tire pressure monitoring system when you start up at the beginning of each day, preventing irritating alerts while you are sleeping. This wiring also gives you the ability to receive the most accurate information from the displays around the clock. Designed from the ground up, extensive customer research has aided us in designing tire pressure monitoring systems for use on RVs, trucks, trailers, fifth wheels, towed vehicles, buses and motorcycles. Our next generation tire pressure monitoring system alerts the driver with both an audible and a visual alert of low tire pressure, high pressure and/or fast leak situations in up to 36 wheel positions. For trucks, we have even included a built-in memory to let you know the exact time and day when and which tire had an alert. The system is engineered to be both simple to operate and to install. No special tools are required. In fact, it is as easy as simply programming the monitor, plugging in the monitor, (or hard wiring it) and screwing on the sensors to the valve stems. How Do Tire Pressure Monitoring Systems Work? The sensors are continuously reading analyzing and communicating signals to the monitor about the air pressure in each tire. With each signal, the air pressure reading is transmitted to the display located nearest the driver. This wireless signal will read up to 130 feet (line of sight) for the truck and RV systems and up to 35 feet (line of sight) for the motorcycle system under most conditions. The systems are designed to do all of this without the use of any additional external antennas! The tire pressure monitoring system display receives this signal and instantly compares the current tire pressure reading with the programmed baseline pressure level. When the sensor sends a signal to the monitor detecting a 12.5% difference in tire pressure from the baseline pressure, both a visual and an audible signal are transmitted. With a flashing tire position light, an audible beep, as well as the flashing tire pressure, the operator knows which tire(s) is/are in need of attention. If the tire pressure drops to 25% below the automatically set pressure level, the operator will receive another audible sound (beeping). The monitor also includes a "Fast Leak" alert to notify you if a tire that is losing air quickly. The "Fast Leak" alarm will be activated when the tire pressure drops by 2.8 psi in less than 12 seconds. In addition, we have even incorporated an optional high pressure alert to warn you in situations where the pressure in your tires have increased by more than 25% above the baseline pressure and may be overheating. If you have a metal skinned coach/trailer or have a longer application, a Signal Booster may be needed to prevent signal loss. For these types of applications, we have three available accessories to assist with boosting a signal: an interior signal booster (model #3624), exterior signal booster (model #3625) and a remote antenna kit (model #3623). For the RV and truck tire pressure monitoring systems, with just one glance at the display, you don't need to review all of your tires' positions to ensure that your tires are operating properly. Just look for the green light, and if it is illuminated, your system is working and your tires are properly inflated. Being a direct tire pressure monitoring system, the system generates more accurate warnings and can alert the driver if the pressure in any one tire falls below a pre-determined baseline level due to either gradual or rapid air loss. There are an estimated 25 million RV enthusiasts in the United States. RV owners travel an average of 5,900 miles annually and spend more than 23 days on the road. For a few weeks each year, you call these wheels home. While you're at home on the road, ensure an extra measure of safety with the best RV tire pressure monitoring system for safeguarding the only thing between you and the road—your tires. 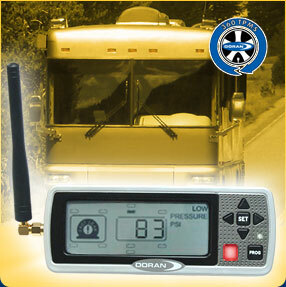 A Doran tire pressure monitor can help make the RV experience a relaxing and enjoyable adventure. The reasons for having a truck tire pressure monitoring system are simple: missing a delivery deadline costs money and damages reputations. But the consequences of tire failure can be much more severe than missing a deadline—accidents, repairs, injuries and worse can result from reduced handling, longer breaking distances and blowouts. Tire failures account for 26% of commercial vehicle breakdowns and are second only to fuel costs in operation expense, yet they can be easily and inexpensively reduced. A truck tire pressure monitoring system tracks tire pressure, letting you know when pressure is as little as 12.5% under manufacturers recommended level. Your truck's proper tire pressure is a key safety factor. 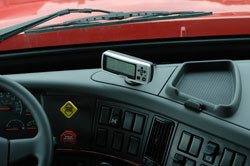 The Tire Pressure Monitoring Systems can protect you, your truck and your reputation. Employing state of the art technology to continuously monitor tire pressure, both high and low, unobtrusively. The system is a low profile, easily installed, all-in-one functional design. The sensors are waterproof, weatherproof and spin-welded to prevent corrosion and provide long-life. The monitor systems small footprint monitor with the large digital display is backlit and has multiple mounting options. The one glance, Green Means Good™ monitor has a fast leak indicator, 12.5% and 25% pressure drop indicators, and memory that retains a list of date/time stamped warnings. Reducing tire pressure issues not only improves safety and prevents expensive repairs but also helps reduce fuel costs: The Department of Transportation estimates that 4 million gallons of fuel per day are wasted (over 1.3 billion per year) because of low tire pressure. The Environmental Protection Agency (EPA) warns that running tires at 20 psi or lower can cost a full mile per gallon. Tire pressure monitoring, combined with proper inflation, can prevent many instances of tire failure. Only about 15% of tire-induced breakdowns are due to sudden tire damage. The remaining 85% start with slow leaks. National Highway Safety Studies indicate at least 50% of the commercial trucks on the road are running on under-inflated tires. Drivers usually notice this gradual air loss too late and serious consequences arise. A tire pressure monitoring systems identify these slow leaks and warn the driver long before the tire risks irreversible damage. The driver can react immediately, checking the tire and inflating, before incurring the costs in time and money an accident, or sitting idle can cause. Monitor power requirement: 12V DC, Typically draws 30mA in standby and less than 55mA when LEDs are on. Of the more than 6,000,000 motorcycles registered in the United States, more than 5,100,000 of them are running on under-inflated tires. Make sure yours isn't one. Under inflation leads to shorter tire life, decreased gas mileage and increased risk of accidents. Enjoy the perfect ride with a Doran 360M™ Motorcycle Tire Pressure Monitoring System and give yourself, and your traveling partners, the peace of mind that your motorcycle tires are safe and ready to roll mile after mile. State of the art technology to continuously monitor tire pressure, both high and low, unobtrusively. The system is a low profile, easily installed, all-in-one functional design. 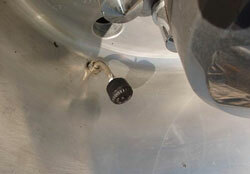 Sensors can be installed outside or inside the tire rim using Doran's valve stems (patent pending). The sensors are waterproof, weatherproof and spin-welded to prevent corrosion and provide long-life. 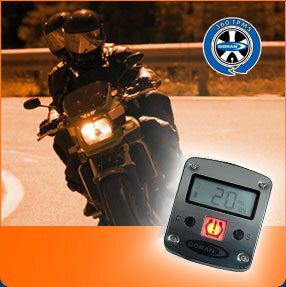 The Monitor itself is a small footprint monitor with a large digital display that can be mounted with the adjustable handlebar mount or elsewhere on the bike, such as under the seat, with only the small LED external warning lamp visible on the handlebars. The removable stainless steel display faceplate can also be custom painted to match your bike if it is to be handlebar mounted. System Booster - The wireless signal is strong enough for almost any common configuration. 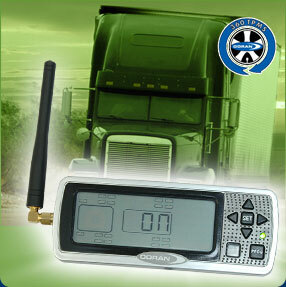 A wireless tire pressure monitor booster is generally used in longer applications, metal skin coaches, or trailers. This booster is simply installed with two wire connections (positive and negative). 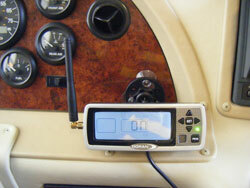 Two wireless tire pressure monitor boosters depending on installation: The Standard Booster is usually mounted inside of a closet of your RV. The Heavy Duty designed to withstand the roughest outdoor environments. It can be mounted on the back of a semi-truck underneath the last cross member. For trucks and RVs, mounting the monitor can be as easy as using a Velcro® pad or using our newly designed multi-bracket. This handy bracket allows the driver to adjust the display to fit the dashboard. 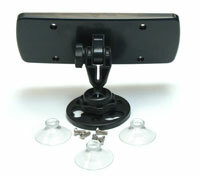 The multi-bracket kit includes suction cups for glass or other flat surfaces, visor clips, or can be permanently mounted with screws, you have the flexibility to select the solution that works best for you. For the motorcycle system, the monitor can be mounted on the handle bars, under the seat or in other hidden areas (with only the indicator light visible on handle bars). Custom designed sensor locks work with most tire/wheel applications and will not cause damage to your valve stem threads. 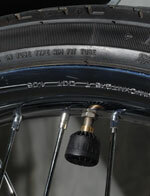 A special plastic lock is inserted over the valve stem. The sensor is then screwed onto the valve stem. Next, pull up on the valve stem lock to engage it into the sensor and use the special Allen head wrench provided to lock the sensor into place. It is just that simple. 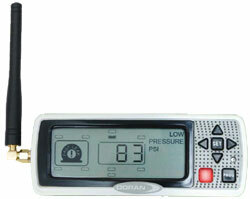 Unlike competitors' tire pressure monitoring system locking systems, Doran does not use a simple lock nut. These nuts are extremely difficult to install in small valve stem spaces. In most cases, you cannot get a tool of any sort into this area. And if you are lucky enough to get a tool in this area, you are still in jeopardy of damaging the valve stem threads from over tightening the nut. Since the thread pitch can vary from valve stem to valve stem, installation can be tricky, as the nut can easily strip the threads. Charter Bus / Commercial Bus / School Bus - Emergency Vehicle - Horse Trailer - Boat Trailer - Construction Equip. Now, there’s no problem checking your tire pressure outside in any type of undesirable weather or conditions. The Tire Pressure Monitoring System displays the tire pressure of each tire directly to you, right from the comfort of the drivers seat. In a Tire Industry Safety Council survey, more than 50% of tires were found to be under inflated. It's time you take control of the safe operation of your Vehicle! Tires running as little as 10% under inflated, lose up to 12% of their tread life. At 20% low, they lose nearly 23% of tread life. Properly inflated tires use less fuel, wear longer, provide greater stability / handling and bring savings. With tires representing the only thing between your vehicle and the ground – at 60 mph – you want to know what your tires are doing to keep the investment in your vehicle safe. Properly inflated tires wear longer, saving hundreds of dollars to replace your tires because of premature wear due to low tire pressures.